Once upon a time..., many fairy tales, collected by the Grimm Brothers, begin with this phrase. For centuries, children around the world have been listening to the Brother Grimms' stories spellbound. Even today, in the 21st century, their fairy tales are going strong. My favourites are Hänsel & Gretel, Cinderella (Aschenputtel) and Little Red Riding Hood (Rotkäppchen). Jacob Ludwig Carl & Wilhelm Carl Grimm were born in Hanau, Germany. The Grimm family had been living in Hanau for more than 100 years. Their father Philipp was a lawyer and town clerk in Hanau, their mother Dorothea née Zimmer hailed from Kassel in North Hessen. 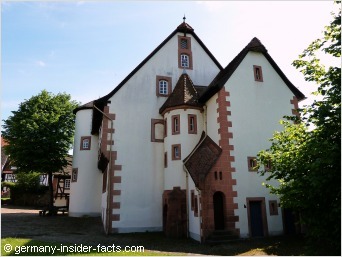 The pictures above were taken at the Grimm house in Steinau an der Straße. The original house where the brothers were born in Hanau doesn't exist anymore, it was destroyed in 1945 during WWII. 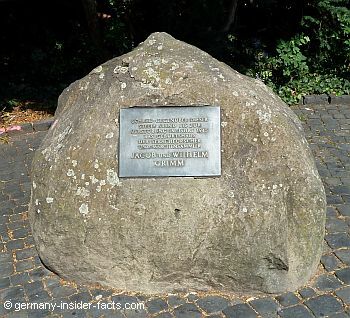 However, there used to be a cairn opposite their house of birth at Freiheitsplatz in Hanau and an information panel is still at the new house commemorate the place. There is also a memorial of the brothers on market place in Hanau. Philipp and Dorothea Grimm had 9 children, but only six survived infancy. Their first son Friedrich died 1784 aged 3 months. 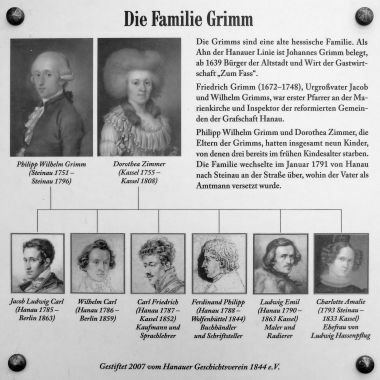 Jacob and Wilhelm Grimm were the oldest sons in the family. The famous brothers studied, worked and led a close life together. Even the fact that Jacob remained a batchelor and Wilhelm had his own family didn't change their close relationship. 1785 - Jacob Ludwig Carl was born 4th January in Hanau. 1786 - Wilhelm Carl Grimm was born 24th February in Hanau. 1791 - Philipp Grimm became a magistrate in Steinau, the town where he was born and his father was a pastor for 47 years. The family moved to Steinau an der Strasse, a village on the Kinzig about 50 km north-east of Hanau. Their aunt Juliane Schlemmer, née Grimm, taught the boys the ABC, to read and write, as well as religion. When the family moved to Steinau, she sold her house in Hanau and lived with the Grimms in Steinau. Tante Schlemmer, as the boys fondly called her, had an important impact on the Brothers Grimm's education. She developed the brothers' intellectual capacities from their early childhood. 1796 - Philipp Grimm died on 10th January in Steinau, Tante Juliane Schlemmer died 10th December, a terrible blow to the Grimms. 1798-1802 - Jacob and Wilhelm were sent to Kassel for a better school education. They attended the "Luceum Fridericianum", their aunt Henriette Zimmer in Kassel supported them during this time. 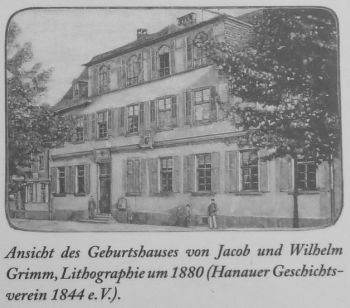 1802-1805 - Jacob studied law at the university in Marburg, Wilhelm joined him one year later. Their professor Friedrich von Savigny opened his private library for the enquiring students. This awakened their interest in Germany's past and the structure of German languages. Due to von Savigny, the brothers got to know romantic poets such as Achim von Arnim and Clemens Brentano. After the Grimm Brothers had finished their law studies they worked in various positions as clerks and librarians in Kassel, continuing with linguistic studies. 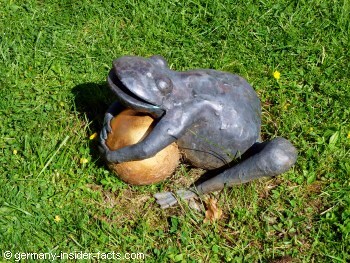 1806 - From 1806 they collected and wrote down fairy tales which they heard in Kassel and its surroundings. Dorothea Viehman in Kassel and two Huguenot families told the brothers tales of the region and of French origins. Jacob's interests were more of research nature while Wilhelm put the stories and tales they heard into a pleasantly written style. 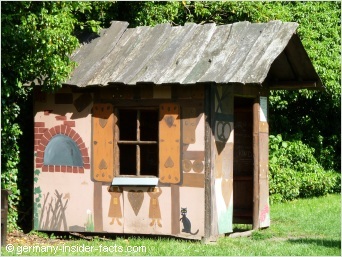 Even many Germans are not aware that the Brothers Grimm's work included more than collecting fairy tales and folk legends. The brothers' primary goal was linguistic research. Especially Jacob's comprehensive studies of history and structure of the German languages of the past became known as Grimm's Law. 1812 - The brothers published the first volume of Grimm's Kinder und Hausmärchen (Tales of Children and the Home). 1825 - Wilhelm married Dorothea Wild, daughter of a pharmacist in Kassel. They had 4 children. 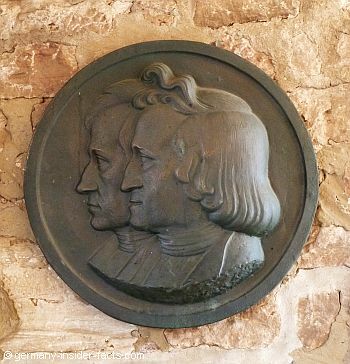 1829-1837 - Jacob & Wilhelm Grimm worked as librarians and professors at the university of Göttingen. 1835 - The first edition of the German Mythology was published. 1837 - King Ernest Augustus of Hanover annulled the liberal constitution which was implemented 1833. The Göttingen Seven (7 professors of the university including the Brothers Grimm) raised a protest against the abrogation. All professors lost their positions, Jacob Grimm and two others were deported. Jacob went back to Kassel. Wilhelm & his family followed soon after. 1838 - The Grimm Brothers began to work on a German lexicon. The Deutsches Wörterbuch became very extensive with 33 volumes. It is considered the standard work of origin and history of German words. The dictionary was not completed until 1960! 1840/41 - The King of Prussia invited the brothers to Berlin. Jacob became a member of the Academy of Science and professor, Wilhelm received a position as professor as well. Lecturing and working on the German Dictionary kept them busy. They both lived in Berlin until they died. 1848 - Jacob Grimm was elected into the Frankfurt National Parliament. He did not play a big part in the 1848 revolution, as he was not made to be a politician. However, Jacob Grimm had a liberal mind, and his biggest wish was an united Germany with freedom and human rights for all its residents. 1859 - Wilhelm Grimm died on 16th December in Berlin. Despite their various professions and scientific work, the Grimm Brothers continued updating their fairy tale collection during their lifetime. Grimm's Kinder & Hausmärchen where translated into almost all European languages. 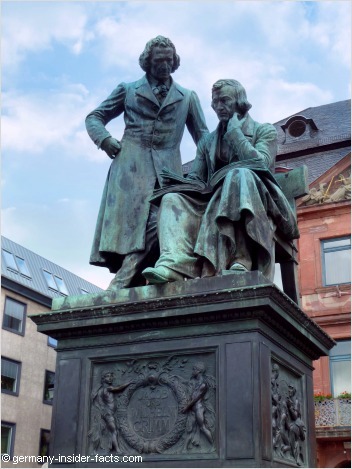 For their scientific work the Grimms are acknowledged as the founders of German philology. As the Freiheitsplatz is undergoing restoration right now (2015), the cairn has been removed. I am not sure yet if they put it back somewhere. The first edition of Grimm's Kinder und Hausmärchen (Tales of Children and the Home) was published on 20th December 1812. It took a few years of editing and transforming the stories until they met the Grimms' perception, new editions followed. The fairy-tales were translated into 170 languages to take off on a triumphal path around the world. Grimm 2013 is the title of an extensive cultural program that includes events in Kassel, Steinau an der Straße, Hanau and other locations in Hessen and along the fairy-tale road. The highlight is the "Expedition Grimm" exhibition in Kassel recognising the multi-faceted work and fascinating life of Wilhelm and Jacob Grimm (2th April - 8th September 2013).